Downhole Wellbore Production & Injection Flow Profiling | Silixa Ltd.
Characterising fluid movement within the well can be the key to understanding and optimising well performance. Silixa’s ArrayProfile™ services utilise distributed acoustic (iDAS™) and distributed temperature (ULTIMA™ DTS) data to offer a means to efficiently gather production or injection profiles along the entire wellbore with minimal or no intervention. Distributed sensing utilises optical fibres within a steel walled cable which can be placed permanently in the well as part of a completion. The optical fibre behaves as a sensor array making it possible to log the entire well path continuously without the need to move the cable and so providing information about dynamic flowing conditions in a way in which conventional sensors cannot. 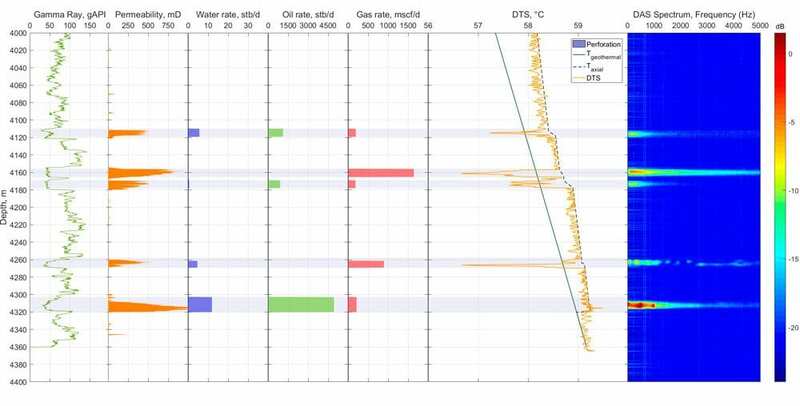 Temperature data has been used in the evaluation of producing wells for many years and is still a core measurement for the production engineer however complimenting temperature information with the unique attributes of true acoustic data gives the user a much more powerful decision support tool. Silixa leads the way in its unique combined approach that employs both temperature and acoustic data in production profiling. Our proprietary computational models are able to differentiate between phases and quantify flow using acoustic and thermal properties of the produced fluids taking the multiphase fluid dynamics into account. Temperature of the flowing fluid in the well is a function of a number of parameters such as the intrinsic thermal properties of the fluids, well components, the geothermal temperature, dimensions of the wellbore, the rate at which the fluid are produced and the duration since the start of production. Our DTS modelling capabilities allow us to accurately model the thermodynamic processes and predict flow rates of each phase produced. 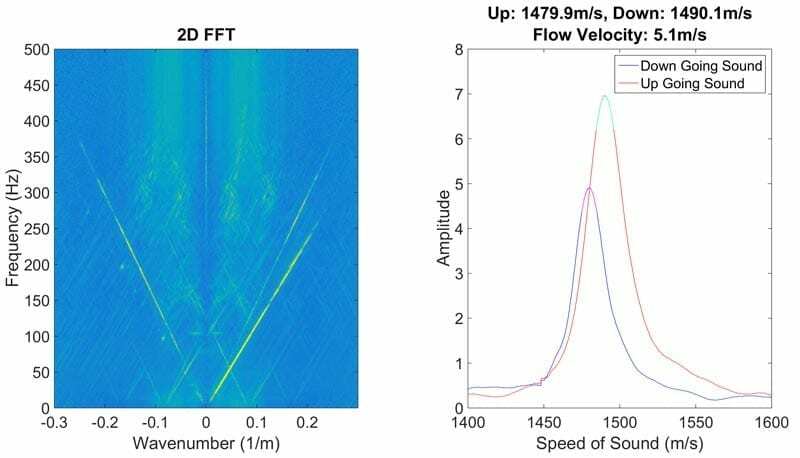 Advanced acoustic processing, unique to Silixa, can be used to determine the speed of sound in the production fluid at different depths; this information indicates in-situ fluid type and can be used to resolve hold-up in two-phase flow. Additionally, the Doppler shift between the speed of sound modes travelling up and down in the well make it possible to measure the fluid flow velocity and hence flow rates for a given tubing size. ArrayProfile™ Software allows for real-time integrated visualisation of temperature and spectral acoustic data for quality control and initial evaluation while a post processing platform facilitates advanced data processing and versatile plotting options so that corroborating answers from independent measurements, iDAS™ and ULTIMA™ DTS, can be presented as actionable information to the user. A permanently installed sensor array installed for the purpose of Production Profiling can also be utilised for acquiring on-demand Seismic data and for monitoring Well Integrity. An accurate illustration of the temperature and acoustic responses of flow along a wellbore. iDAS captures the true acoustic field (amplitude, frequency, and phase) at all points along the well. Silixa’s advanced data processing techniques include conversion to the space-frequency domain (k- ω) allowing individual speed of sound components to be identified, including those travelling within the well fluid both in an uphole and downhole direction (above left). The speed of sound in a production or injection fluid contains valuable information about the fluid composition and also allows the flow velocity to be determined from the Doppler shift between up-going and down-going sound (above right). The ability to extract this information from acoustic data along the entire instrumented well path signals a new era in well performance monitoring.